Ashley: Politics can be a sensitive subject. Some people can have civil debates about their political views but most of the time, it’s just a terrible conversation. It’s especially terrible when it involves family members. The Crane family is no exception, but it’s certainly a lot funnier than watching my father and I discuss why I voted for Obama (twice) over prime rib while my mother sighs heavily. Initially, what would you as the viewer believe Frasier and Niles to be politically? Democrat? Republican? What about Martin? To me initially, it goes back and forth for the whole family. In “The Candidate” however, it appears that Niles and Frasier are supporting the liberal candidate whereas Martin is supporting the conservative candidate. And Martin does so with gusto: he participates in two television spots that include a witty play on words (“He’s running because I can’t) as well as showing his gunshot wound scar to the camera a la Lyndon B. Johnson. At first, Niles and Frasier don’t really seemed interested in being involved. Sure, they’ll vote for Phil Patterson, the underdog liberal candidate, but as for being a bigger voice in the campaign, it doesn’t seem like their style. But they join up and do so for a selfish reason. The impetus for Niles to get involved is due to the embarrassment caused by Martin’s LBJ reenactment. Frasier’s, on the other hand, is caused by Holden Thorpe challenging him on the air after he makes disparaging remarks about Thorpe’s campaign. The selfish pomposity of the Brothers Crane is what gets them involved politically. And Phil Patterson turns out to be quite the handful. I loved watching Frasier’s two takes on the commercials. The first time watching Frasier confidently sail through, the wording of the spot seems pretty straightforward. However, once we hear Phil’s confession, the wording is delightfully double-edged and Frasier nearly breaks down, realizing what a terrible mistake he’s made supporting a candidate who clearly needs counseling because he believes he’s been abducted by aliens (I really love Phil’s comment about California in the end of episode, and yes, it would help him here. We vote for weird in the Golden State). In “Adventures in Paradise”, we get to see Frasier find someone he’s truly attracted to and with whom he feels he has a future. And through a blind date no less! Having found Madeline Marshall in an article in Seattle magazine, Roz makes the call on his behalf and a romance blossoms. Frasier and Madeline make plans to fly to Bora Bora for a week. 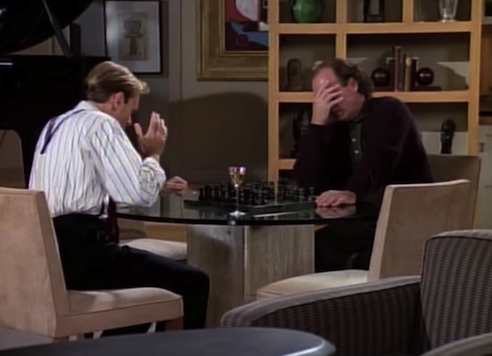 Frasier starts to feel the pressure and anxiety of moving the relationship too fast. To me, however, I feel similar to Martin: he feels a spark for Madeline so go for it. Have a fun week with her in paradise and don’t worry so much. Andrew: That Martin would back someone who is tough on crime is not at all surprising. He is a decent person, but is cynical and, as a former cop, believes in law and order. On the other hand, the fact that Frasier and Niles refer to Thorpe as a fascist should give Martin pause; he’s probably been around enough criminals to know that not all of them are hardened blights on society. Hell, he invited an ex-con over for poker once. Frasier and Niles make total sense as latte liberals, though. They like to believe in high-minded, progressive causes and champion “the little people,” so long as they don’t have to actually come into contact with those little people. Niles lacks the capacity to see the irony of sending his “servants” to do the grunt work to elect Patterson and Frasier thinks he’s doing great works of protest by refusing to order coffee from countries that have histories of atrocities. (Hey Frasier, nearly every country has done something bad at some point. Not even the North Pole is innocent, as it harbors polar bears, the scourge of the Arctic Circle.) “The Candidate” gently satirizes the two-party system by forcing Frasier to choose between someone whose policies are reprehensible and someone who is literally crazy. When there are only two viable candidates (although third-party candidates do run, it is cynical “common knowledge” that a vote for a third-party candidate is a vote against the major candidate closer to his or her views), what do you do when there are no legitimate choices? As the first part of a two-part episode, “Adventures In Paradise” is fairly light on conflict for Frasier, because the entire episode serves as a set-up for the final reveal of Lilith in the cabana next to Frasier in Bora Bora, as well as for the next part. Everything was coming up Frasier; a smart, successful, and attractive woman happily went on a blind date with him, he was charming, and they hit it off immediately. And yet the episode works and remains funny. Frasier has some internal conflict about his fear of how well the relationship with Madeline is going, and other people’s conflict provide Frasier with opportunities to prove his worth as a psychiatrist. In addition, the scenes with Frasier’s family work well for the most part, with no one questioning why Daphne needs to know whether the correct term is “serial killer” or “serial murderer” so that she can include it in a letter to her mother, and Niles making such a colossal Freudian slip about his marriage that even Daphne takes notice. I must admit that I did find the plot point about Niles smoking the cigar a bit gross, because he decided to give it a try after Daphne wistfully spoke about her positive associations of men and cigars, based upon her memories of her grandfather. Ashley: I have never heard the term “latte liberal” before but I absolutely love it. What a perfect description of Niles and Frasier doing their part in politics. They want to get Phil elected because he’s a proponent for funding the arts. I think the Crane Boys genuinely enjoy opera, theatre, the symphony, etc. but I think a good portion of that enjoyment has to do with the social aspects (parties, connections). As far the “little people” are concerned, I’m not sure what is meant by this. It’s interesting as I’m sure no constituent would enjoy being called a member of the “little people” much like being referred to as “Joe Plumber”. I love the barista that always jabs Frasier, especially in this episode about the slaughter of macadamia nuts. Frasier fully believes he is an Every Man, thinking he’s doing the right thing about how he chooses his coffee. I had someone give me a lecture on my quinoa intake in the same kind of manner. Apparently my quinoa jambalaya was affront to this young man and I was an elitist American determined to make the people of east Africa starve because I just had to have my quinoa (I just wanted to try it, it was on a header at Trader Joe’s, and I was a little tired of rice). As for Niles the cigar, I don’t think it’s so terrible he tried it because of Daphne’s fond memories of her (scary) grandfather. He wants to impress her and why not do so by doing something that one of her loved ones used to do? I’m not saying I’d be keen on a man if he started smoking a pipe (my dad smoked a pipe when I was kid and I still love that smell) but it’s not all that terrible. I love that scene with them around the piano smoking and drinking. It looked like a good but of fun despite Frasier’s sour attitude regarding them smoking inside. I liked the first part of “Adventures in Paradise” and how happy Frasier was with Madeline. Their first date in the French restaurant is such a fantastic scene. It’s so theatrical and fun to watch: the sweet family running the restaurant, almost anachronistic for modern-day Seattle, discovers their daughter is pregnant with the busboy’s child, and all hell breaks loose. Frasier talks Etienne down from shunning his daughter Yvette, and manages to keep the family together: Just another night out with Frasier Crane. I liked this episode because Frasier was finally happy. Having Lilith show up to ruin the happiness disappointed me a little but I understand it was done so for the comedy. Andrew: Frasier was mostly happy, but even with such a great situation for him, he couldn’t help but be Frasier. His overanalysis of a good thing would have destroyed the relationship if not for his family’s intervention. With Frasier, nothing is simple. And, as we will see next week, Frasier’s reaction to Lilith will do so much more to undermine his happiness than her actual presence. What a nice little commentary. I believe life experience to be somewhat of a has been these days in terms of criticism, but then again, this proved that wrong. Congratulations on the acute and progressive criticism of one of my favorite television shows.